Jay Simpson’s sixth goal in 7 games rescued a point for Leyton Orient as they drew 1-1 with Wycombe Wanderers. Matt Bloomfield put the Chairboys ahead 5 minutes before the break and the visitors were the better side for large periods of the contest. Orient struggled to create in the first period but Ollie Palmer’s introduction provided the home side with the impetus to draw level 24 minutes from time through Simpson. Both sides could have nicked a winner in the final stages with Simpson nearly adding a second but was denied by a fine Matt Ingram save. The point keeps Orient in top spot with Wycombe remaining in 4th after the result. The O’s who drew 1-1 away at Cambridge last weekend made 1 change, welcoming back Dean Cox to the starting 11 in place of Bradley Pritchard who missed out through injury. 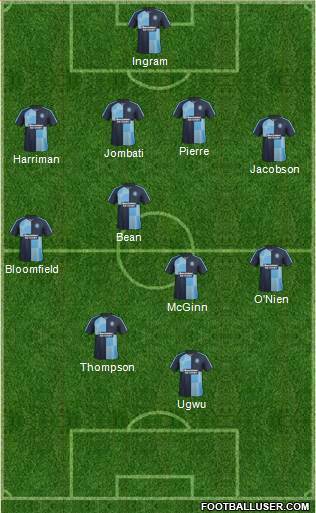 Wycombe who lost their unbeaten run to Plymouth last week made 2 changes with captain Matt Bloomfield returning alongside Stephen McGinn in place of Daniel Rowe and Jason Bantom. In a somewhat low key start to the contest, the visitors started the brighter with Garry Thompson firing a shot over after just 4 minutes. Wycombe who were unbeaten on the road were penning Orient in, in the opening minutes but were failing to trouble home keeper Alex Ciask. Jay Simpson, who netted Orient’s equaliser at Cambridge last weekend saw a header blocked for a corner as the home side were growing in to the game. Despite having possession, Orient look adrift of ideas in attacking areas with the tempo low once more seeing them struggle to create. Simpson looked Orient’s brightest player and a neat turn and shot was blocked by Marcus Bean as the home side tried to grab the initiative. Wycombe still remained firmly in the contest and with the O’s giving away cheap free kicks, Joe Jacobson had plenty of opportunities to highlight his dead ball delivery. A free kick caused Alex Ciask problems when the home keeper’s punch went behind him but Connor Essam was there to sweep up. Orient had kept three clean sheets in their opening 3 home league matches but looked far from convincing in defensive areas. Gozie Ugwu was next to try his luck for the away side but his shot was blocked before Michael Harriman fired the loose ball wide. Then the visitors were nearly gifted an opener when a poor Lloyd James back pass was picked up by Garry Thompson. Alex Ciask was alert to smother the midfielder’s effort and quickly saved Stephen McGinn’s effort; from the resulting corner Pierre saw a header saved by Ciask. Dean Cox missed last week’s game was struggling to have an impact on proceedings as he was unable to find space in attacking areas much to the fact that Wycombe had changed their system. Marcus Bean was playing deeper to prevent Cox having space to pick up the ball. However 10 minutes before the break, Cox’s neat link up with Simpson saw the midfielder cross for McCallum but the striker was unable to connect with the cross. Sammy Moore followed up at the back post but saw his effort deflected over for a corner. Wycombe did grab the opener 5 minutes before the break, Jacobson who had been getting his eye in on his crossing was free on the left. With the home side failing to close down the left back he crossed in to the center, the loose ball fell to Bloomfield who tapped in to send the Chairboys ahead. Despite joy in the opening games of the season playing the midfield diamond, Orient were once again struggling to create in attacking areas in the first half. Wycombe were shepparding the home side well and were prevented space to play in. Hendon reacted at the start of the second half replacing Lloyd James with Ollie Palmer. 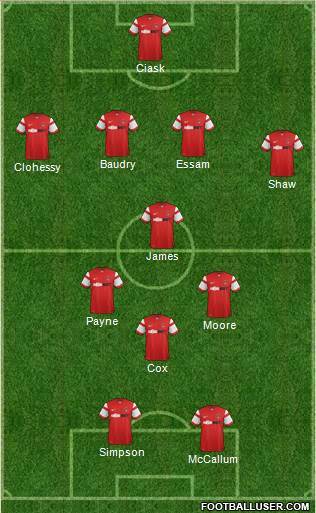 Jay Simpson moved to the right hand side of midfield with Orient going for a more conventional 4-4-2. The home side continued to look shaky in defence at the start of the second half and with no change in attacking areas Hendon brought on Blair Turgott for Paul McCallum with Simpson moving back up front. Wycombe were continuing to link up well in attacking areas with Pierre forcing Ciask into a smart save on the hour after he controlled a Jacobson free kick and shot at goal. After Orient’s change in formation at the break, Cox moved to a left wing position and he went close but headed over when Jack Payne and Blair Turgott linked up down the right. Palmer was providing a much needed physical presence in attacking areas for the home side with his energy and work rate encouraging the home side forward. Orient levelled after 66 minutes, persistence from the two substitutes forced Wycombe into an error at the back. The ball fell to Turgott who squared to Simpson who slotted home from inside the penalty area. After the goal, Orient were straight in the ascendancy with Blair Turgott seeing an effort deflected wide for a corner as Orient’s attacking players began to link up. Palmer flashed an effort wide after neat play between Cox and Simpson. Simpson nearly added a second 11 minutes from time, Cox picked out Simpson who was free in the centre. Orient’s leading marksmen cushioned the ball dead, shifted the ball on to his left foot but his goal bound shot was tipped round the post by Ingram. Wycombe were on the back foot after being pegged back as they struggled to push out however could on another day been awarded a penalty. With Orient failing to clear a cross, Palmer looked to clear the ball as Matt Bloomfield nipped in, the Wycombe bench were immediately looking for the penalty but their appeals were waved away. Both sides in the end had to settle for a point. It was the third game in a row for the O’s were have struggled to create whilst playing the midfield diamond, something which Hendon sees, “Teams are changing their way of play to stop us playing, we can play different systems, we have a couple up our sleeves”. It could be a worry for Hendon, with teams willing to sit behind the ball and let Orient break them down. Something which Orient have found hard in recent weeks but the lack of tempo and speed in their play could be an issue. Ollie Palmer is certainly knocking on the door for a starting berth ahead of Paul McCallum who has seemed to go off the boil after a fine start to the season. The former Mansfield striker gave Orient a presence in attack and added energy, which was pivotal to their equaliser. Bradley Pricthard’s energy was missed in midfield but Jack Payne looks a decent addition but it is not certain where the former Peterborough captain’s best position may be. Despite the draw, Orient still remain top with teams below them also drawing and the battling qualities will please Hendon. However conceding first in the last 4 games will not please the Orient boss but despite not playing well they still sit top. Wycombe played some nice football at times and will be there or there about this season in the promotion race. Orient face a tough trip to Northampton next weekend with the Cobblers coming off the back of a 4-2 victory away at Morecambe yesterday.